In this new episode of The Capt’n Galleys, we got more Surf Clams from our favorite “Clam Digger” Dave from Isle Madame, a small beautiful island attached to Cape Breton Island in Nova Scotia. Capt’n Kenny created this delicious Clam and Pan Seared Tuna Linguini in a Peppery Salty Broth especially for the occasion, after an old recipe he learned many years back when visiting Nova Scotia, much before living in the province. These Atlantic Surf Clams belong to the North American species of Surf Clams that can also be found in the coasts of the UK and can be found from Nova Scotia down to the New Jersey coast. The empty shells of these clams is found in many beaches along the Atlantic coast and can get as big as 20 cm (7.9 inches) long, which makes them great for crafts and ornaments. For this dish, Capt’n Kenny chose again one of our local wineries, Jost wines’ Tidal Bay white wine, which compliments the peppery note of the broth and balances out the palate with the crispness of apple and apricot flavors. We would like to thank “Clam Digger” Dave for the amazing Surf Clams, Blain Anderson of Anderson Fisheries for the Tuna and Jost Wineries for the help with the pairing of the wine. 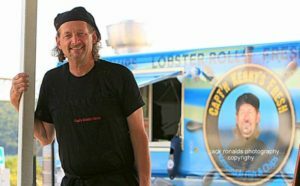 For more information about “Clam Digger”Dave, please contact us via our contact link at the bottom of our page. As always, let us know how you like it, and if you prepare it, let us know how it went. We are always improving our recipes and your feedback is essential for the development of new, easy recipes. We will be happy to hear your comments! 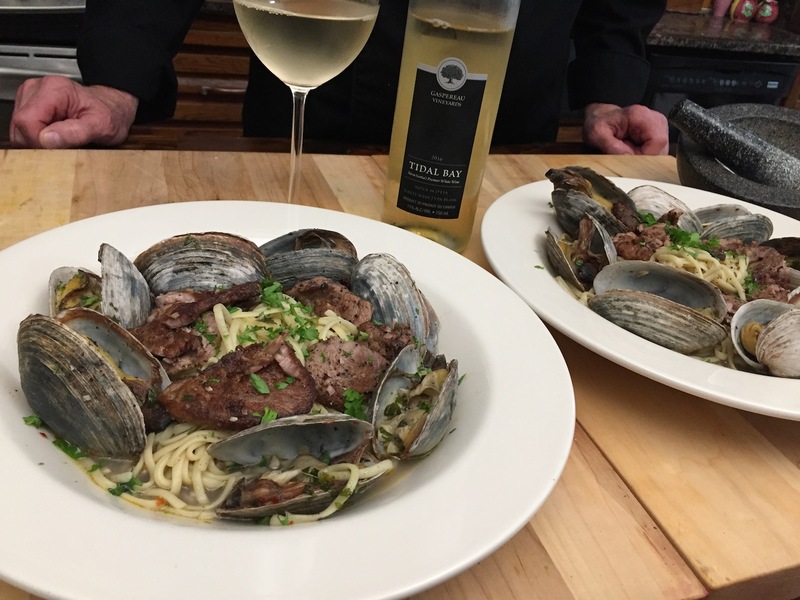 North Atlantic Surf Clams cooked in a Peppery Broth in a Linguini bed topped with Pan Seared Tuna steaks. Pasta: Boil a large pot of Sea Salted water. Cook pasta al dente (check the package for timing). Al dente means the pasta is still firm but cooked without having a raw inside. When cooked, drain and add cold water for the pasta to stop cooking until needed. Sauté on medium heat 2 tbsp butter, 2 tbsp parsley, ½ tsp pepper flakes, 1 heaping tbsp fresh ground black pepper, 5 cloves of garlic finely minced. Cook about 5 minutes until the garlic is golden brown. Add 1 cup of white wine. Add clams. Cover and cook on medium heat until clams have opened. Discard any clams that did not open. Cut Tuna into a ¼ inch medallions. Season with salt and pepper. Heat large pan with 2 tbsp butter and olive oil. Wait until oil and butter is bubbling and add tuna. Cook for about 3 minutes, turning once. Use a slotted spoon or tongs to remove cooked tuna. Add drained linguini to the clams, clam juice, 1 tbsp of butter, lemon zest and warm up until pasta is ready. Plate linguine and clams, add the Tuna on top, garnish with parsley. Capt’n Kenny likes it very spicy. You can reduce the amount of Pepper on the broth to half if you don’t like it too spicy. ← Capt’n Kenny’s Style Fried Clams with Clam Corn Broth, Creamy Cajun Dip and Creamy Tabasco Chipotle Lime Dip. This sounds so yummy I’ll have to try it sometime ! Thank you Tina for your kind comments! Please let us know how you like it when you prepare it! Great recipe! I prepared it and my family loved it. We will be making it again! That is great news Joanne! We will be posting more delicious recipes like this one again in the future. Thank you!